We abstain from including in this collection the so-called “Letters of H.P.B. to Dr. Hartmann”, which were first published by “The Path” in its editions of January 1896, pp. 297-300, and February 1896, pp. 366-373. William Q. Judge, the editor of the magazine, seems to have been optimistic about their authenticity. These are a few examples among many: the main object of the “Letters of H.P.B. to Dr. Hartmann” seems to be convincing its readers that Franz Hartmann was a great occultist. Franz Hartmann’s novel “The Talking Image of Urur” was published in the pages of Blavatsky’s magazine in London. It contains scarcely veiled, brutal attacks against her, and she had to force the end of its publication. However, Hartmann always tried to maintain an elegantly ambiguous position, thus being able deceive many in the theosophical movement. More on the views of H.P. Blavatsky (and her Masters) regarding Franz Hartmann can be seen in “Letters Between Blavatsky and Judge – 01”, which is available in our associated websites. Readers are invited to take into consideration especially its opening Editorial Commentary. The present chapter opens referring to February 1890, when the situation had already changed. An acceptable level of accomplishment for her incarnation had been attained in London some time after the publication of “The Secret Doctrine” in 1888. Chapter 13 starts with H.P.B. calmly taking some rest on the seashore. By the end of the chapter, H.P.B. mentions “Charlie and Vera”. In August, 1888, theosophist Charles Johnston had married Vera Vladimirovna de Zhelihovsky, the daughter of H.P.B.’s sister Vera Petrovna. The marriage was at H.P.B.’s home at Lansdowne Road, in London. “Letters of H.P. Blavatsky to A. P. Sinnett”, TUP, Letter L, p. 121. Other references made by HPB on F. Hartmann will be found on pp. 118, 158, 159, 229, 237, in the same volume. “Letters of H.P. Blavatsky to A. P. Sinnett”, TUP, Letter XLVIII, p. 118. “The Letters of H.P. Blavatsky to A.P. Sinnett”, transcribed by A.T. Barker, Theosophical University Press, Pasadena, California, 1973, 404 pp., see Letter CL, p. 299. “The Letters of H.P. Blavatsky to A.P. Sinnett”, see Letter CXXXIII, p. 277. The legend about Hercules and Cerberus can be seen at “Greek and Roman Mythology”, Thomas Bulfinch, Dover Publications, Inc., Mineola, N. York, copyright 2000, 301 pp., pp. 118-119. “Lucifer” magazine, London, April 1895, Concluding part of a text by Vera P. Jelihovsky entitled “Helena Petrovna Blavatsky”, pp. 99-108, see pp. 103-104. “How She Left Us”, a text by Laura Cooper included in the volume “In Memory of Helena Petrovna Blavatsky, by Some of Her Pupils”, Theosophical Publishing Society, London, 1891, 96 pp., see pp. 3-7. “The Works of Christina Rossetti”, Wordsworth Poetry Library, Wordsworth Editions Limited, 1995, Great Britain, 450 pp., see the poem “Dream Land”, at pp. 50-51. “In Memory of Helena Petrovna Blavatsky, by Some of Her Pupils”, Theosophical Publishing Society, London, 1891, p. 7. “As you see, I am in Brighton, on the seashore, where I was sent by the doctors, to inhale the oceanic evaporations of the Gulf Stream, to get rid of a complete nervous prostration. I do not feel any pains, but palpitations of the heart, a ringing in the ears – I am nearly deaf – and weakness too, such weakness that I can hardly lift my hand. I am forbidden to write or read or even to think, but must spend whole days in the open air – ‘sit by the sea and wait for the fair weather.’ My doctor got frightened, himself, and frightened all the staff. It is an awfully expensive place; and my money – alas! So my esotericists put their money together immediatly and persuaded me to go. And now subsidies fly to me from all points of the compass, for my care; some of them even unsigned, simply to my address. America especially is so generous that, upon my word, I feel ashamed. I admit that they ‘want’ me, as they repeat twenty times a day, but still, why should they spend so much? They keep me in a luxury as if I were an idol, and don’t allow me to protest. “It is easy for him to speak, but all the same I must put the third volume of the Doctrine in order, and the fourth – hardly begun yet, too. It is true though that in my present state of weakness my head keeps nodding, I feel drowsy. But, all the same , don’t be afraid. There is no more danger. Take consolation from the enclosed newspaper cuttings. You see how the nations magnify your sister! 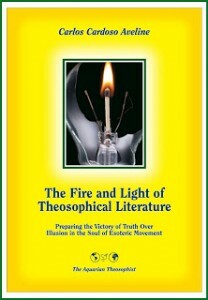 My Key to Theosophy will bring many proselytes, and The Voice of the Silence, tiny book though it is, is simply becoming the Theosophists’ bible. Mme. Blavatsky was as pleased as a child with all the new arrangements, and yet she had a foreboding she was to die in this new house, and spoke of it to her sister. Her next letter, dated July, describes the opening of her new lecture hall.